The sound could be a little smoother but the RHA MA650 Wireless are otherwise solid, good-value wireless earphones. Headphones are going through a strange period. For years, they were nearly the same in terms of components, design and feature set - they were wireless or wired, and you knew wired was always going to be better. Now it's a struggle not to call earbuds like the RHA MA650 “traditional”, as true wireless headphones like the Apple AirPods, the Jabra Elite Sport and Sony WF-1000X have started to make older designs like this seem, well, old. However, compared to the likes of those, the RHA MA650 are probably a more sensible buy for most people, with much better battery life and less of an innovation tax attached to the sticker price of £99/$99/AU$105. Most big headphones brands make a pair of wireless earphones that look like the RHA M650: Sennheiser has the Momentum In-ear Wireless, Beats has the X and Sony has its MDR-EX750. But all cost at least a little more than the RHA MA650. Undercutting much of the competition has been an RHA tactic since the beginning, and it's one that continues to pay off here. 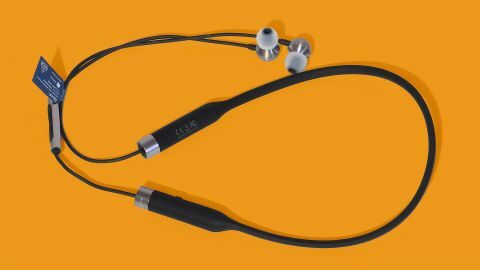 And while you might feel like that price cut comes at the cost of the headphones themselves, there’s nothing cheap-feeling about these earphones. The MA650 have all-aluminium earpieces with the same bulbous bell shape RHA has used elsewhere for years. In short, they look smart, and glint when they catch the light just the right amount thanks to their brushed finish. The part of the RHA MA650 that sits around your neck is an ultra-flexible piece of rubbery cabling. It holds its shape, but flexes with ease and doesn’t clamp onto you at all. Instead, these earphones use the weight of the chunky terminal blocks that sit by your collarbone to keep the pair in place. This strategy works well, and you can even wear these happily while running. They're splash-proof to the IPX4 standard, and don’t bounce about like some pairs of this style, meaning they're just as comfortable at the gym as they are on your daily commute. The earpieces then simply snake up to your ear canals on short cables. After a while, once the neckband is the same temperature as your skin, the RHA MA650 feel more-or-less like normal earphones. We’ve found the tips do tend to work their way out if you don’t push them in quite far, but as usual RHA includes a good selection of silicone tips in the box. There are standard tips, dual and triple flanged ones and even a foam pair - a boon for those of us who struggle to find a perfect fitting tips for our ears. Some neckband wireless earphones cram remote controls into the band part. The RHA MA650, on the other hand, have a separate 3-button remote just like you're used to using on a normal wired pair of earbuds. The remote controls are universal, and work with Androids and iPhones alike. You can raise/lower the volume with the outside buttons and play/pause and change tracks with the central one. As usual there’s a mic built into the back of this remote housing that lets you take calls and even talk to your phone’s digital assistant, and a long press on the central remote button will get the attention of Siri or Google Assistant. Still, these are conventional features and the RHA M650 doesn’t offer much beyond the norm: no active noise cancellation or voice translation, as Google recently showed off on its Google Pixel Buds. They do have NFC, however, and support for aptX. NFC lets you hook up with an NFC-equipped Android phone just by waving it over the left side of the band, while aptX offers higher-quality streaming for phones that support it. iPhone users are out of luck, though, as iOS can’t make use of either of these features. Battery life is fairly good at 12 hours, and you can get a vague update on the battery level by quickly pressing the power button. A robot voice tells you the charge level, to the nearest 20%. If you're more of a visual person, a little LED by the power button also turns red when you’re almost out of battery. The RHA MA650 use a USB-C charging socket rather than the older microUSB type. If you use an iPhone or have an older Android this might be the first gadget you have with USB-C. These earphones only come with a short charge cable, presumably with the idea you might plug them into your laptop at work. You also get a little fabric carry case, although we’ve found the very flexible neckband makes them quite easy to stash in a coat pocket. We’re reaching a point where anything but near-perfect wireless performance is below average. Thankfully, the RHA MA650 wireless is great, with the same sort of blip-free experience you get with pairs from Sony and Beats. We also had no problems with pairing - in case you've struggled with that in the past. The RHA MA650 are fairly good-sounding headphones. They have decent scale of sound for a pair of in-ears and bass that is punchy without getting close to booming out and ruining the sound balance. These are earphones with enough power but no bloat or stodginess. However, they are also actually the lower-fi pair out of RHA’s new wireless line-up. RHA also makes a pair called the MA750, which are £50/$50 extra and look similar, but use a better driver. The RHA MA650 have 380.1 drivers, the MA750 have 560.1 ones. These are RHA names that don’t tell us much aside from that the ones here are entry-level. You can hear this in effect too. The RHA MA650 are a little hard and unrefined at the points where the mids meet treble. This area is pronounced rather than softened in an attempt to make the earphones sound more detailed, more vital, but with some music this can backfire a little. For example, Trent Reznor’s multi-tracked background vocals of Nine Inch Nails’s The Downward Spiral album sound even more cutting than was intended. This approach to the high mids also invites hard “S” sounds in vocals generally, and leaves the RHA HA650 with a less relaxed sound than, for example, the Beats X and Sennheiser Momentum In-ear Wireless. It’s likely the higher-end MA750’s better drivers will improve this. However, the MA650 sound is still enjoyable and satisfying, particularly if you don’t find yourself put off quickly by a bit of an edge to your headphone sound. The confident power of the low-bass in particular is good fun, particularly when it doesn't come with an overall thickening of the sound that can ruin a soundstage’s presentation. The RHA MA650 are a competent pair of wireless headphones. Their design is good, their price is reasonable, battery life is respectable and wireless performance, generally speaking, is top-notch. Sound quality is good rather than mind-blowing. There’s plenty of power, good scale and width, but some of the higher frequencies are a bit hard on the ears.